Did you know outdoor kitchens are the second most popular home remodeling project in America after the good old indoor kitchen? In a telephone survey taken by the Hearth, Patio & Barbeque Association, Americans spent nearly $150 billion on home remodeling projects. Out of this spend a whooping one third went towards outdoor living areas. The statistic does not include outdoor kitchens exclusively but it signifies an emerging trend: taking the kitchen outside. But what is an outdoor kitchen exactly? "Outdoor areas in which food is prepared are generally not considered to be kitchens, although an outdoor area set up for regular food preparation, for instance when camping, might be called an 'outdoor kitchen' ". However most home designers agree that a project to be called an outdoor kitchen it must include at least one good-quality cooking appliance like a gas grill or a wood-fired oven, some counter space and a sink. Outdoor kitchens serve as a great way to serve and have enjoyable meals with your family and to host luncheons, dinners and outdoor parties for your guests. Cooking outside in shade can be a great relief in summers. Till about a few years back elaborate outdoor kitchens were considered as an indulgence of people with higher incomes. The cost of building, and more so maintaining these kitchens was way too high. But now almost everyone can enjoy a great outdoor kitchen at bargain prices. The industry has become pretty competitive and equipment and construction rates are something which you should consider grabbing. Seeing the potential of this segment many do it yourself companies now also offer kits so you can make one all by yourself. 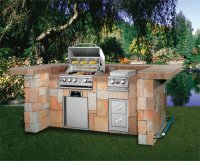 The growth in outdoor kitchen construction has been part of a larger trend to make better use of yard space. An emerging trend is the widespread usage of prefabricated outdoor kitchen islands. A prefab island is a large pre built structure that has space for installing a gas / charcoal grill and comes with plenty of counter space and other amenities such as cabinets, refrigerators and even dishwashers. The advantage of using these islands is that they are completely customizable and save you all the hassles of construction. Simply order an island and the delivery man will deliver it to your doorstep. Just plug in the water and gas lines and you ready for burger, steaks and brats! There's an interesting story how the kitchen islands became popular. Remember the highly popular primetime television soap opera Dallas (from 1978 to 1991). It centered around the Ewing family, a wealthy Texan family in the oil and cattle-ranching business. The producers of the show felt that the gas grill of the family should reflect the status and lifestyle of the family. They approached the Ducane Company to design an outdoor grill. The company designed a model consisting of dual grills and lots of counter space. The design opened up the imagination of home owners and a whole industry was born! Prefabricated islands are available in a huge variety of shapes and prices. A simple grill island could cost you around $700. There's no upper limit practically. Elaborate models come with attached benches, seating areas, lighting, umbrellas, fireplaces, fire pits and even plasma screen televisions! For homeowners who decide to take the plunge, outdoor kitchens can be a manageable and rewarding do it yourself project .It will involve work but is pretty doable. A typical DIY project could take around 50 man hours provided you have all the plans and materials in place. A good option is to do most of the heavy work all by yourself and bring in contractors for skilled jobs, such as laying gas cables or hooking in the gas appliances. If you have a more flexible budget you could hire a contractor / designer. A reputable contractor will help you design an outdoor kitchen, as well as provide a drawing, and free in-home consultation. Outdoor kitchen designers also make use of CAD (computer assisted designing) to sketch out your dream kitchen. Just give in your ideas and a designer would make a blueprint for you on computer. You could add or remove elements as you wish. Once a blueprint is ready the final construction can be commenced. "It's not the money which will make you happy, it's what you do with that money that will make you happy." Jatin Dhillon is a freelance writer, web publisher and a hopeless barbecue addict.